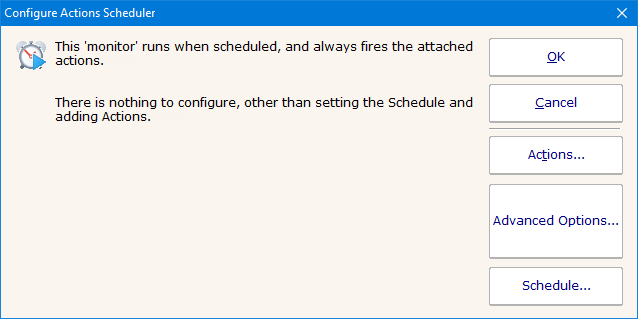 The Actions Scheduler 'monitor' is not really a monitor like all others. It does not check for a condition and alert if that condition is found. Instead, every time the monitor runs, it executes all actions that are attached. This 'monitor' makes it very easy to schedule IT automation tasks by simply setting the schedule for when the tasks should run, and adding the Actions that you want to run. Like all monitors, this monitor has standard buttons on the right for Adding Actions, setting Advanced Options and setting the Monitor Schedule.